Memorial Day, July 4th, 9-11, Veterans Day. Over the past year, I have spent each of these commemorative holidays planning and teaching my English 1101 course, “American Veterans and the Non-Traditional Memoir.” While helping students improve their writing and communication skills, the class examines the way veteran soldiers tell their war stories through the mediums of film, fiction, non-fiction, websites, and poetry. The students work on Farewell to Arms by Ernest Hemingway, The Thin Red Line by James Jones and Terrance Malick, some Korean War websites, The Things They Carried by Tim O’Brien, the poetry of Seth Brady Tucker, Dear Mr. President by Gabe Hudson, and Love My Rifle More Than You by Kayla Williams. In addition, they consult supplemental material about the history and war experience of minorities, including women, African Americans, women, and Native Americans. I consider these works to be “non-traditional” because they challenge the image of war as a virile, romantic, or predictable story, an image often propagated by popular films and some news media. Only a soldier can tell us the truth not only about war, but also about the difficulty of life after returning from war. Yet, as recent reports about the PTSD that can push a veteran to commit suicide tell us, this truth cannot always appear in a logical, linear journalistic style. What and how they remember is not logical once they come back home and the sometimes erratic dreams or memories conform more to what we would associate with fiction than with truth. In a Huffington Post article published by David Wood on July 4, 2012, Tom Berger, a former medical corpsman with the 3rd Marine Division in Vietnam, explains how reality becomes distorted for many post-war: “Left untreated, you reinforce the trauma, so it makes sense to keep that loaded .357 [revolver] next to you on the car seat.” In the same article, Dr. David Speigel, a neuropsychiatrist and director of Stanford University’s Center on Stress and Health, admits “War is an unnatural experience. It doesn’t surprise me that a substantial number of people are impaired.” While wars in Iraq and Afghanistan are winding down, it is clear that another battle is beginning at home with the return of over two million soldiers of whom a quarter million have already been diagnosed with PTSD. Psychiatrists believe that many more have and will continue to live undiagnosed while their condition worsens. In The Huffington Post on September 14, 2012, Former US Assistant Surgeon General, Dr. Susan Blumenthal, reported that the suicide rate among active-duty military has reached a thirty-year high, which includes an eighteen percent increase over the last year alone. On average, one occurs per day and the number of suicides this year has surpassed the number of soldiers killed in combat. Military suicide has become a national health crisis and it has become clear that treatment is a must for most veterans whether they say they need it or not. This crisis makes a call for innovative therapies, which have been answered by a wide range of solutions, including campus and community outreach programs and even an anti-suicide nasal spray. In the search for new treatments, an increasing number of veterans, teachers, and doctors alike have acknowledged the effectiveness of creative writing and filmmaking. Through the literary readings in my class, my students and I have discovered that the veterans we study suffer from about three conflicting realities, which often blur: the home, family, or job situation, the way that media and culture represent the war, and the memories of their personal combat experience. However, these memories do not seem to occur in the past, but in real-time, and they appear involuntarily. Unable to find adequate language to express the memories, vets feel that no one except for fellow vets can really understand what happened to them, which isolates them from friends and family. Yet the need to tell the story remains. By manipulating language, chronology, and images of these different realities, writing fiction for them renders a more truthful telling than the clearer, more linear style of non-fiction. More importantly, fiction gives them the space to constantly reexamine and recreate their experience, allowing them to work through and understand it. These memories are overwhelming and become crippling, and they need to unpack and repack them so they become more manageable. And I thought: ‘That’s editing.’ Editing allows you to take a recording and reorganize it in a way that expresses what you want to…Film is their medium…Particularly with soldiers under 30, it’s where they live. They’re the YouTube generation. The older guys, the ones over 55, their stories are different. They tend to be a touch more literal, and the younger guys are [much]…more metaphorical. While returning vets may be the “YouTube generation,” many are also turning to writing novels and poetry. 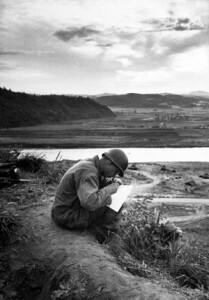 On September 11, 2012, in an article entitled “Stories From a New Generation of American Soldiers,” published on the NPR website, Quin Lawrence reports that recent novel releases reveal that the new generation of soldiers want to show “how their experiences give them the authority to describe the war, fictionalize it and even satirize it.” One of the writers featured, Brian Castner, who wrote The Long Walk, explains, “I just knew I had a story that needed to come out, and I wasn’t the father I wanted to be, and I wasn’t the husband I wanted to be.” After completing it, he wasn’t fully healed, but he does admit that “There’s no cure for any of this. Do I feel that overwhelming pressure in my chest every second of the day? No, and fortunately, that’s passed…But I’m planning on living my life with it from now on. I don’t expect it to just not be there anymore someday.” Another vet, Kevin Powers, author of Yellow Birds, a short novel about his disjointed combat experience in which the Sisyphus-like narrator feels like he is fighting the same battle over and over again, says that fiction makes what he writes about more intense than what he really lived. 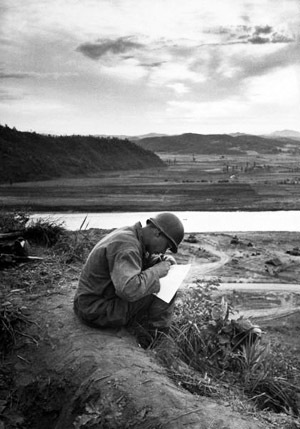 This new generation of writer and filmmaker vets accomplish what other writers have been able to show us about previous US wars; in war, nothing is short or logical and a completely coherent use of language can never fully express the real experience. Hemingway, with his long descriptions of food and drink during WWI, teaches us about the agonizing “hurry up and wait” phenomenon of battle, which can be just as damaging as combat itself. He also brings out the idea that, since death can happen at any time, each moment of life must be spent on love and enjoyment, a concept that doesn’t quite translate into civilian life. James Jones and Terrance Malick in The Thin Red Line trace the evolution of a soldier fighting in the Pacific Theater during WWII. Ultimately, he realizes he is “already dead” and consequently is able to overcome the fear of killing and dying in battle. It is a process and an understanding that many cannot shake when they return home, not quite comprehending why they are still alive. Tim O’Brien blurs the boundaries of fiction and memoir to highlight the enduring and ever-changing quality of painful memories that bring up issues such as survival guilt after the Vietnam War. Gabe Hudson has one of his characters grow an ear on his stomach as a result of Gulf War Syndrome to show how the US government turned a blind eye to the suffering of this war’s soldiers. As teachers, we know how to trace the relevance of whatever we are doing in the classroom to the contemporary news media world. Over the past year, Veteran’s Day, Memorial Day, July 4th, and 9-11 have given me the opportunity to pause and think about how I teach this material to students. On each of these days, I am always able to find two kinds of commemorations: the official, somber kind in which soldiers and families respectfully pay tribute to lives lost and the kind in which vets express their anger and frustration at the futility and suffering as a result of their efforts. This past Memorial Day, a group of Iraq and Afghanistan vets lined up in front of the NATO summit in Chicago to give back their medals by tossing them in the street. Only blocks away, a parade featuring uniforms and Taps commemorated with the expected pomp and circumstance. Both kinds of demonstrations represent a different kind of reality about post-war experience. However, after teaching these texts and films, I see that another real experience exists – the one that lies in between the honor and the frustration. It is a space housing the story of each individual soldier, a story that, when told in a linear style using traditional language, fits neatly into the categories of honor or frustration. But when it is told using literary language and style, it becomes much more complex and doesn’t allow for one easy interpretation. My students usually start the semester on either the honor or frustration side of this space. Even though it is more difficult to understand, I think they do start to grasp that this in-between space is just as real and perhaps more truthful. Their big semester project is to write the memoir of a veteran who is also an alumnus of Georgia Tech. In small groups, they are paired with a veteran and they interview and record him or her on film. They must then retell the story as a website using images, the video interview, and different modes of text. With a few exceptions, they will write the story in a traditional fashion with a clear beginning, middle, and end. However, they report that they feel this is insufficient and often pair their text with images and sound that better express the inexpressible moments with their vets. One group intermixed pictures from the Vietnam War with images of the vet today to show the still-strong presence of his memories. The inexpressible also finds its way in the presentations they give about their project. One African American student was in tears as he talked about his assigned vet’s work with the Tuskegee Airmen project. A powerful message came through in those tears that couldn’t have been expressed on the website. Most of my students say that this project was an eye-opening experience and that they had never realized the complexity of living life after war. Still, I always have some that report that they didn’t like the literature we read because it didn’t contain enough action or because they felt that the narrators should have been tougher soldiers. These authors shouldn’t have needed to write these kinds of stories if they were real heroes or real men. I wonder if maybe I’ve gotten it all wrong, and then I think it is hard to deny that, as a community, we all want war to be something it is not. Despite all the bloodshed, we still at times want it to both empower us and bring us closer together as a country. While I have spoken extensively with some student veterans at Georgia Tech, I have yet to have one in my class. But I know that it will happen soon, since many of those two million will be attending Georgia Tech and other universities. I hope she or he will be able to help me better understand that in-between space that I try to teach. I hope she or he will be able to perhaps tell the class a real story, and that we will be able to appreciate and honor it. Orth-Veillon is a Marion L. Brittain Postdoctoral Fellow at the Georgia Institute of Technology. She teaches courses in human rights, artistic expression, and technology. Orth-Veillon received her PhD from Emory University in Comparative Literature, where she specialized in the intersections between political resistance and literature. She also holds a Maitrise and a DEA (Dilpome des Etudes Approfondies) in French Literature from the University of Paris VII. Her research interests include the intersections of human rights, technology, and creative expression, political theory, genocide studies, 20th and 21st-century French and Francophone literature and film, fiction writing, and translation from French to English.